Shaduppum, A City Full of Surprises. Shaduppum. Ain’t it a beauty? In 1945, on the southeastern outskirts of Baghdad, the ancient city of Shaduppum was discovered at Tell Harmal. Excavations soon got underway, led by Iraqi archaeologist Taha Baqir, and Muhammed Ali Mustafa of the Iraqi Department of Antiquities. (Source) The excavations unearthed an Old Babylonian city with a collection of close to 3,000 tablets. Now, with so many tablets in its hold, it’s no wonder Shaduppum’s patron god is that of writing and record-keeping, and that it was an administrative hub for Babylonia. Within Shaduppum’s walls, private homes, one administration building, and seven temples were unearthed, some reconstructed. 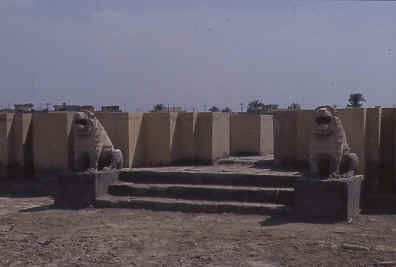 Of the seven temples, a large one dedicated to Nisaba, the Sumerian goddess of writing and record-keeping, and her consort, sits just inside the city’s gates. That temple’s entrance was guarded by two roaring terra-cotta lions. 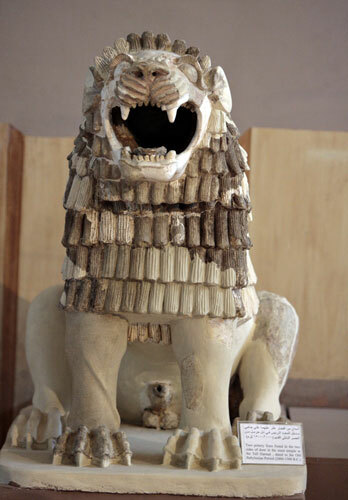 One of the terra-cotta lions at Shaduppum, on display at the Iraqi National Museum. Accountants aren’t all about numbers! So, almost 3,000 tablets were unearthed at Shaduppum, but only a few weren’t of an administrative nature, and you’ll find that the nature of these non-administrative tablets is a little surprising. I find it surprising, anyway, that a city with such a cut and dry purpose had a copy of The Epic of Gilgamesh, the world’s oldest written work of literature, in its vaults. It was some nine decades after the standard Akkadian version of the ancient poem was discovered in Ashurbanipal’s library at Nineveh, that two tablets of it were unearthed at Shaduppum. The next surprise is actually two surprises in one. The Laws of Eshnunna, Eshnunna being the city north of Ur where they originated, were promoted by that city’s ruler, Bilalama. In 1948, a year after Baqir’s discovery, Albrecht Goetze translated and published the laws, revealing that though Bilalama had some two-hundred years on Hammurabi, he was a little more progressive than the man whose laws inspired the Ten Commandments. That’s right. Unlike Hammurabi, whose punishments usually featured maiming, if not death, Bilalama implemented a monetary, fine-based penal system. But don’t get too comfortable with Bilalama’s laws, because the more serious offenses, including sexual ones, were punishable by death. That’s pretty progressive! Shamash: These aren’t the first laws. Hammurabi: What?! Wait–. Shamash: Shhh. Now smile for the chiseler! 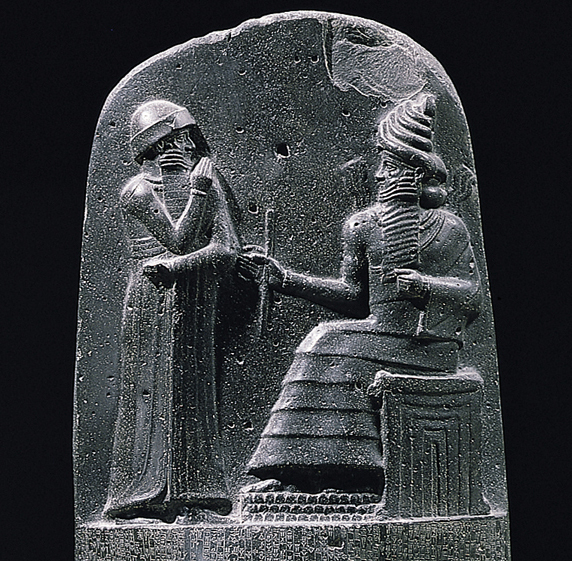 Hammurabi was not the only one whose thunder is stolen by tablets at Tell Harmal. The one-upping found in Shaduppum’s collection of tablets didn’t even stop at Mesopotamia’s borders, for it extended all the way to the Greek realm, delivering the two bombshells I’m going to talk about now. Now, even if you used math class (or history) as nap time, the names Euclid and Pythagoras should sound familiar to you. 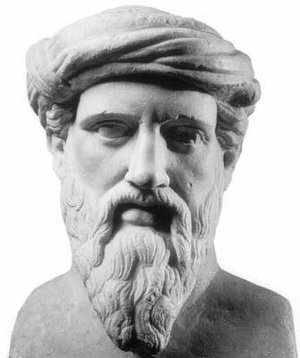 And if not (it’s okay), I’ll refresh your memory: Euclid of Alexandria is the father of geometry, and Pythagoras of Samos proved that in a right-angled triangle, aka, the Pythagorean Theorem. The tablets that steal a bit of Greek mathematician thunder. Sorry, Bros. Though the fact still remains that Euclid and Pythagoras gave us the official real deal, complete with proof and universal mathematical truths, two tablets dating to the early second millennium BC deliver the same newsflash Hammurabi got about his laws: Kinda’ been there, kinda’ done that. The algebraic-geometry on one tablet (the one on the left in the picture above) features work similar to Euclid’s, dealing with the hypotenuse of a right-angle triangle. The other tablet features a problem with a rectangle whose length and width are calculated using what is essentially the Pythagorean Theorem. So, the first round of excavations at Tell Harmal was fruitful, but a second round in 1997 turned out to be all about details. The Iraqi Department of Antiquities and Heritage allowed more excavations at Tell Harmal that year, this time by a joint effort between Baghdad University and the German Archaeological Institute. Because of Shaduppum’s relatively late rise to prominence, in the spring of 1997 and autumn of 1998, the collaborative project took a closer look at the rock layers of the city, confirming different ages in the multiple building layers. Most interestingly, stratigraphy of the city’s walls showed it was not fortified until the rise of Babylonia in the second millennium BC, suggesting that its rise to prominence was quite significant–it went from being a city so inconsequential it lacked fortification, perhaps, to a city with pronounced walls. Evidence also suggested then that the city had been destroyed by fire and destruction around the time of Hammurabi, then rebuilt. It’s a very interesting project that you can read more about here. There remains much we don’t know about Shaduppum, that we may never know, but one thing is clear: Shaduppum was a city that had a little bit of everything that made it a Mesopotamian city worth a look.